Check out this awesome interactive analytical map that we created together with our New Zealand implementation partner Smart GIS Solutions in CORPIS MAPS. 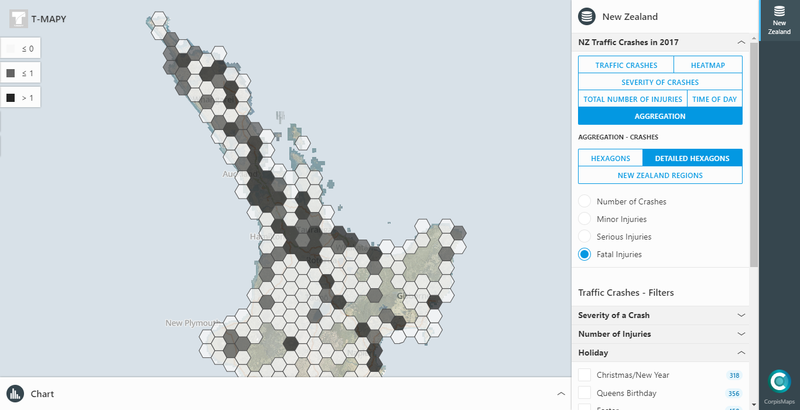 The map shows New Zealand crash data (Crash Analysis System data) from the NZTA Open Data Portal and enables you to see crashes with all the crash details in various visualizations. All of this in the highest possible geographic detail together with a unique hybrid basemap (street + aerial basemap). In the map, you can easily check what happened when and where, which gives you plenty of information about the crashes in your neighbourhood and knowledge for the future. When you drive or walk the crash place next time, you will slow down or be more careful when it rains. This map helps to keep you, your family and friends safe. Tell them about the possible traffic risks that can happen on their way to work or school. Are you interested in CORPIS MAPS? Contact us. CORPIS MAPS is a unique configurable map application for spatial analysis of any data. The application enables intergration with other information systems (e.g. ERP/CRM/BI/E-commerce). CORPIS MAPS becomes more and more popular because of its ease of implementation and the value of analytical information provided to the end users. Analytical maps created in CORPIS MAPS are used in many ways - in most cases as a Corporate Geographic Business Intelligence system that helps businesses to analyze their sales results and potential spatially in order to get more insight and knowledge of the market, clients, potential - this knowledge has a significant impact on their sales growth and overall success in the market. Founded in 1992, T-MAPY has grown to become a key provider of geospatial solutions. Our extensive know-how and experience in geoinformatics, information technology, geography, cartography, data processing and analysis and much much more allows us to design and develop standalone geospatial solutions for public administration, emergency services, transportation, and the private sector.